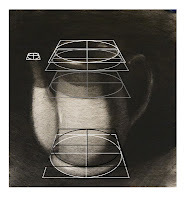 Paint Draw Paint, Learn to Draw: Drawing Basics: Drawing an ellipse. 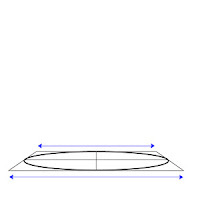 Drawing Basics: Drawing an ellipse. The ellipse is a shape that commonly appears in the shapes and forms of everyday objects. 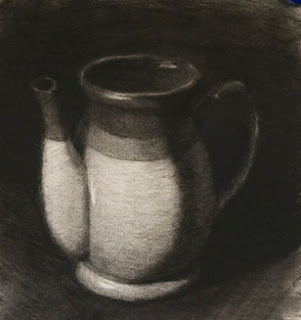 If we want to draw those objects in a way that mimics what we see in life, we will need to understand the ellipse as a shape and how it functions. Today, we are going to look at how to draw an ellipse and how the ellipse behaves in three dimensional space. Like drawing a circle or other uniform shapes, drawing a uniform ellipse can be done with a little practice. Let's start by the looking at how ellipses are formed visually. 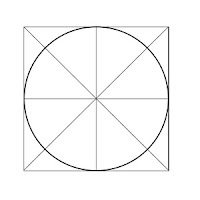 As a shape, an ellipse can be described as a flattened circle. This circle is pushed together at the top an bottom. When we see an ellipse in the physical space around us, the ellipse can be a circle seen in perspective. In the diagram to the right we have a circle. This will be the starting point for our ellipse. 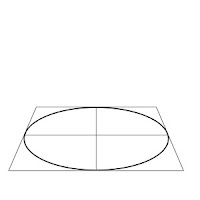 We can think of this circle as the opening to the pitcher drawn above. If we were peering down the top of the pitcher, we would see the opening of the pitcher as a circle. Once we step back and away from the pitcher we no longer see the opening as a circle. This because the plane of the opening of the pitcher is no longer directly facing us. This plane of the pitcher's top has been tilted back. When the plane of the opening of the picture tilts back, the circle compresses vertically in the visual field. Notice how the space in the ellipse does not compress equally. The back half of the circle is compressed more than the front half. This is the foreshortening that occurs when we see the surface of an object at an angle. 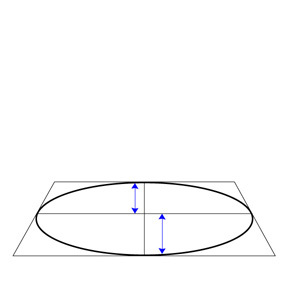 The farthest points to the left and right of the ellipse do not rest in the vertical middle. They sit slightly above the vertical center. Similar to the concept in perspective that objects closer to the viewer appear larger than objects further away, when looking at an object in perspective the parts of the object closer to the viewer will appear larger than the trailing parts. 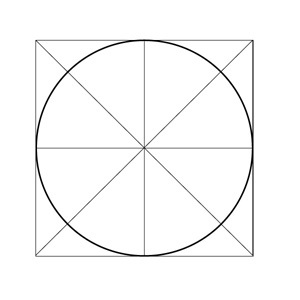 Representing farthest points of the ellipse is a box drawn around the ellipse. 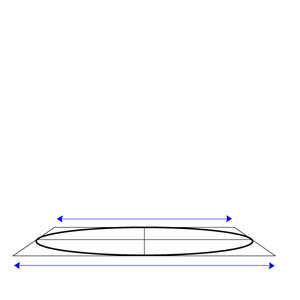 This box represents the surface plain of the ellipse in perspective. If we go back and look at the diagram of the circle, the box is square. Here the box is foreshortened so that we see this plane from a particular perspective. Notice that the trailing edge is shorter than the front edge. Here is our circle seen from a different viewpoint. Notice that the ellipse is compressed even further. 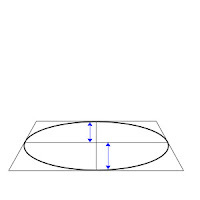 If we add the orthogonal lines of one point perspective to the ellipse to the right, it and the box around it would have lines the converge above and behind the shape. The ellipse becomes narrower the close it moves towards eye level. 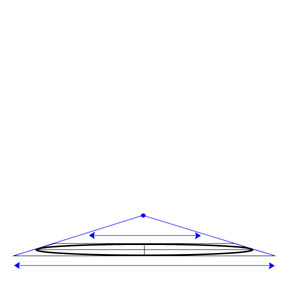 If the ellipse is at eye level it disappears into a line. 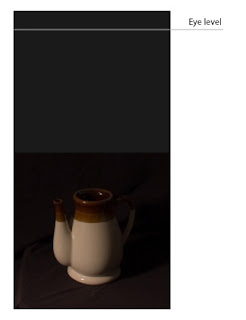 For example, at eye level the the top of the pitcher is flat like a table top. If we move the eye level up or down just a little the ellipse emerges. 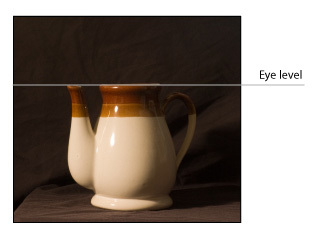 Here is an example where the eye level or horizon line is further above the pitcher. 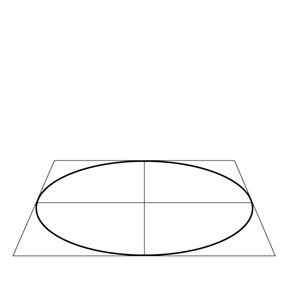 The ellipse created by the opening is larger the the ellipse in the image of the pitcher above. This is because the top of the pitcher is further away from eye level. This drawing of the picture is an example of drawing multiple ellipses below eye level. 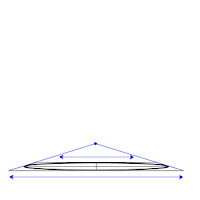 Each ellipse resides in a different space as it relates to the eye level. In order to have the pitcher read like it is in three dimensional space we need to get each ellipse to take shape according to its distance away from the eye level. Take a look at the drawing with several of the ellipse overlaid on top of it. Notice how each ellipse grows gradually taller as we move down the pitcher. 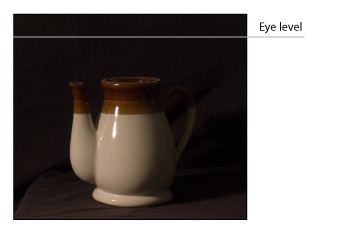 This is because the eye level is above the pitcher and as we move away from eye level the ellipses become less foreshortened. Understanding the role the ellipse plays in creating form and how it relates to a view point will guide us as we develop realistic compositions. 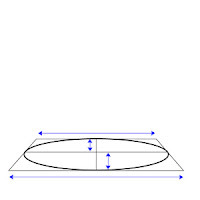 One common mistake made when drawing an ellipse is to pinch the sides of the ellipse, creating a football shaped object. Also, the ellipse is a symmetrical shape and right half will take the same shape as the left half. As with so much in drawing, well drawn ellipses just come with practice. Thank you ever so much for this article on ellipses, very very helpful, I always seem to have a problem with these.